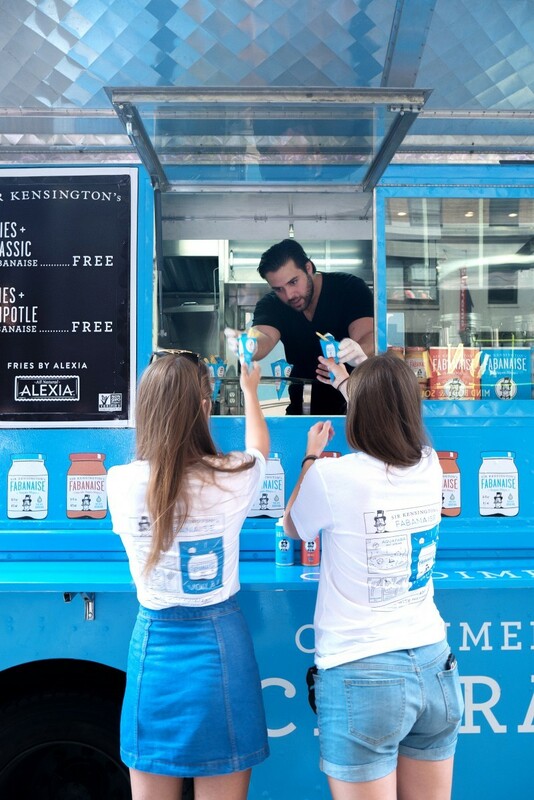 Sir Kensington’s, a NYC-based company that makes “condiments with character,” wanted to raise awareness and sales of Fabanaise, the first vegan mayo made with aquafaba (the water left behind after cooking chickpeas) which replaces eggs in traditional mayonnaise. So how did a Fabanaise Food Truck end up at the White House? On October 3, 2016, President Obama invited creative thinkers nationwide to the South by South Lawn (SXSL) festival to discuss ways to tackle the country’s toughest challenges. Several innovative food vendors were also invited, including sweetgreen, a local health food restaurant and favorite of First Lady Michelle Obama. This restaurant already served Sir Kensington’s products and felt that their “condiments with character” would be a good fit for SXSL, so they suggested that Sir Kensington’s participate as well. The Fabanaise Food Truck Tour was scheduled to visit 21 Whole Foods Market locations in New York, Philadelphia, and Washington, DC. There was just one problem. Alexia provided the fries for fry cones that were customized with a special “dipping pouch” for Fabanaise. In return, Alexia received brand exposure and couponing opportunities. The Fabanaise Truck Tour surpassed targets for the distribution of fry cones, coupons, and recipe cards. Fabanaise sales spiked on the day of the activation and even three days later, sales were still double at Whole Foods Market tour stops. Sir Kensington’s was so impressed with the results of the Fabanaise food trucks that they hired Promobile Kitchen for a second campaign—a national Road Trip to Dip tour, highlighting more of Sir Kensington’s condiments from avocado oil mayo to chipotle Fabanaise to “special sauce.” “The goal was to sample as much product as possible by expanding to additional retailers, reaching new customers in new markets, and providing marketing support to solidify relationships with current store buyers and executives,” said Dominick. The Road Trip to Dip Tour was designed and executed to make a big impact. Launched on the east coast and west coast simultaneously, two trucks set out to hit major metropolitan areas with sampling. To amp up the buzz in Chicago and DC, top local chefs participated in FRYday Battles, and competed to develop their own fry recipe with a Sir Kensington’s product. A consumer taste test picked the winning chef who received $5,000 for the charity of their choice. Since there are no losers with a Sir Kensington’s product, the runner-up received $1,000 for their favorite charity, too.